A reminder that Wool N’Things will be closed on Mondays during the months of June, July and August. Store Hours are posted at Store Hours/Location. KENZIE by Hikoo Has Now Arrived! KENZIE by Hikoo is a New Zealand yarn with 50% merino, 25% nylon, 10% angora and 5% silk noils. Considered a tweed, the merino, angora & alpaca gives this yarn softness and body, the nylon provides strength and the silk noils give it a delicate texture and color accents. Great for knitting accessories and garments, many free patterns are available at www.skacelknitting.com/kenzie-magalog/ or you can also check out Ravelry at www.ravelry.com for lots of patterns (purchase will be required). Exciting New Concept From Rowan! 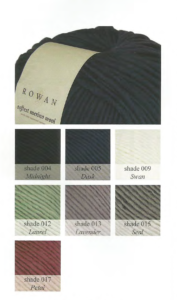 This Fall/Winter, Rowan will be introducing a limited release selection of new yarns to include Fine Silk, Cashmere, Hemp Tweed Chunky and Softest Merino Wool. 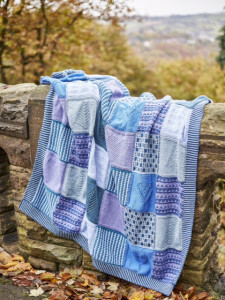 Many wonderful patterns for babies, men and women will be available with the launch of these new yarns designed by some of our favorites, Lisa Richardson, Sarah Hatton and Martin Storey. A fine yarn made in Italy with a silky sheen, it is soft to your touch because of merino and viscose fibers. *Please note that the color of the actual balls of yarn will differ slightly due to the original print quality of the color swatches shown here. Made in Italy this is a soft cashmere yarn made of 95% cashmere and 5% wool, ideal for babies and womens garments. It is recommended that you wash your finished garment before wearing to maximize the softness. Hemp Tweed Chunky is soft to the touch with a modern tweed effect. A 'breathable' yarn, hemp tweed garments will naturally soften with wear and are resistant to stretching. Ideal for cool weather garments and accessories, this super soft chunky roving yarn is made of 100% extrafine merino wool.